China is involved in a maritime dispute with Japan in the East China Sea and with Taiwan, Vietnam, Malaysia, Brunei, the Philippines in the hydrocarbon-rich South China Sea. 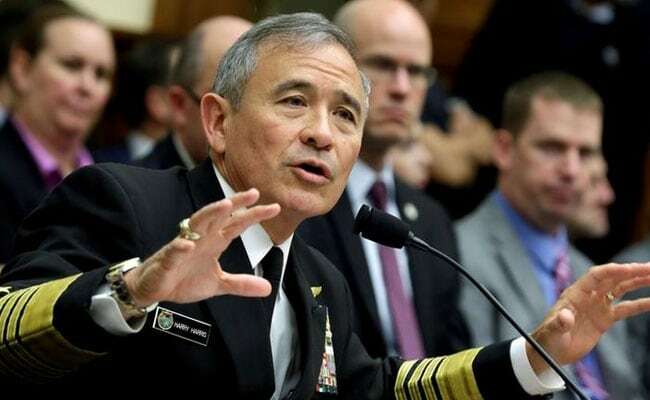 New Delhi: China is a "disruptive transitional force" in the Indo-Pacific region, Admiral Harry Harris, the commander of the US Pacific Command, said on Thursday in an apparent reference to maritime disputes in the South China Sea. He asked how defensive would Vietnam, Malaysia and the Philippines be when China has staked claims on the waters also claimed by the Association of Southeast Asian Nations (ASEAN) nations, comprising the former three countries. "I believe the reality is that China is a disruptive transitional force in the Indo-Pacific. They are the owners of trust deficit," Mr Harris said. He said this during a panel discussion at the Raisina Dialogue in New Delhi with Indian Navy chief Admiral Sunil Lamba, Japan's Admiral Katsutoshi Kawano, and Australian Navy chief Vice-Admiral Tim Barrett. The discussion saw chiefs and officials of the navies of the "Quad", comprising India, Australia, Japan and Australia. Mr Harris said working with China is still possible in the areas of disaster response and counter-piracy. Indian Navy chief Lamba said since 2008 the Chinese navy is operating in the Indian Ocean Region. "It is the kind of the presence that is going to be in the Indian Ocean for the foreseeable future," Admiral Lamba said. Japan's Admiral Katsutoshi Kawano said China is changing the status quo in the Indo-Pacific region and it is important for India, Australia, the US and Japan should cooperate. On the trust deficit in the Indo-Pacific, Australia Navy chief Admiral Barret said there is a trust between militaries of the region than there is on political dialogue.